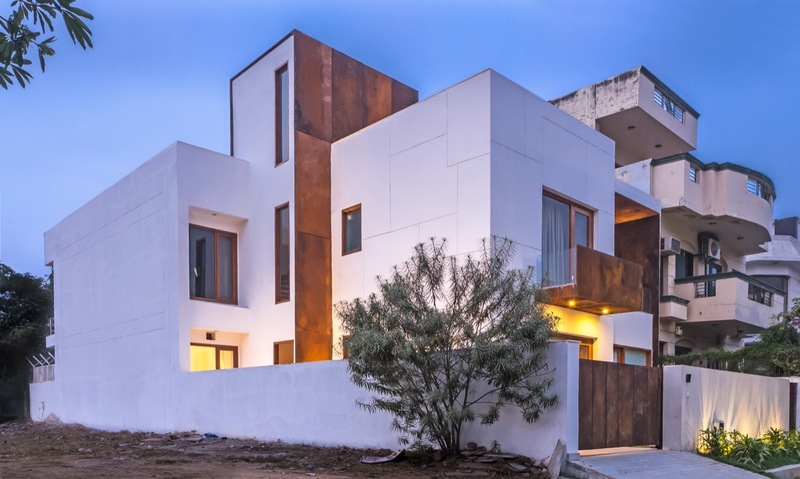 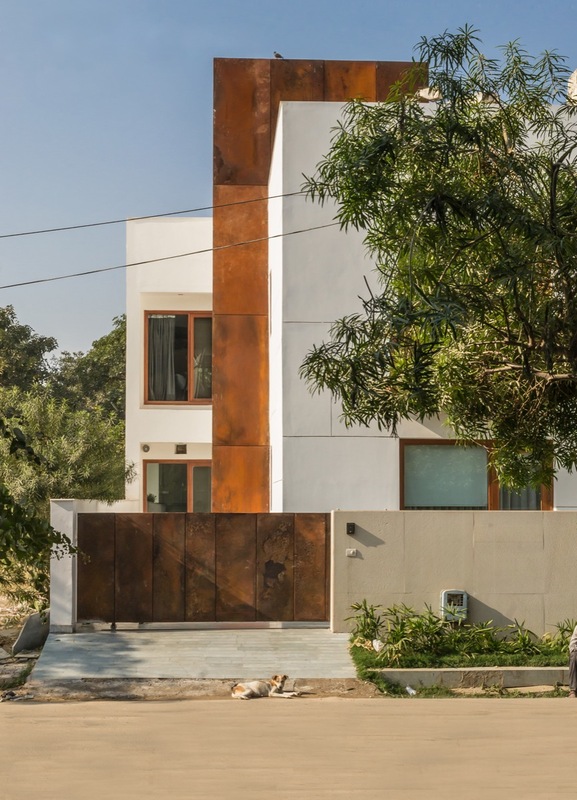 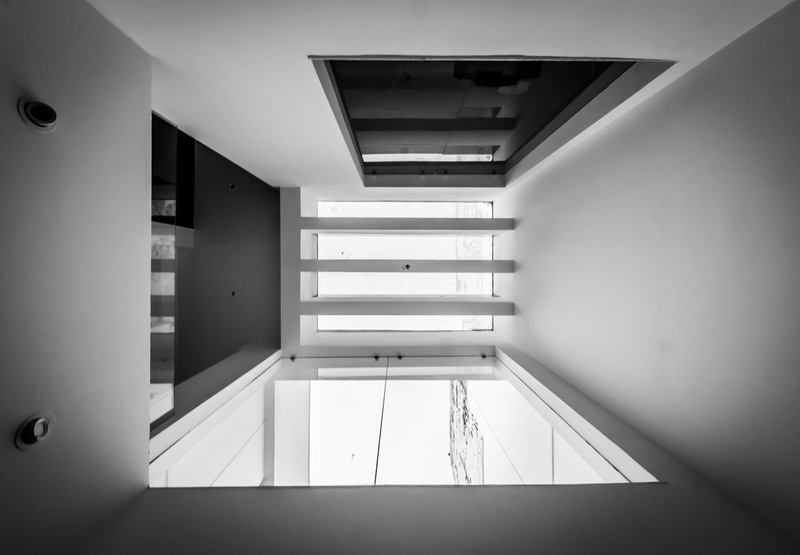 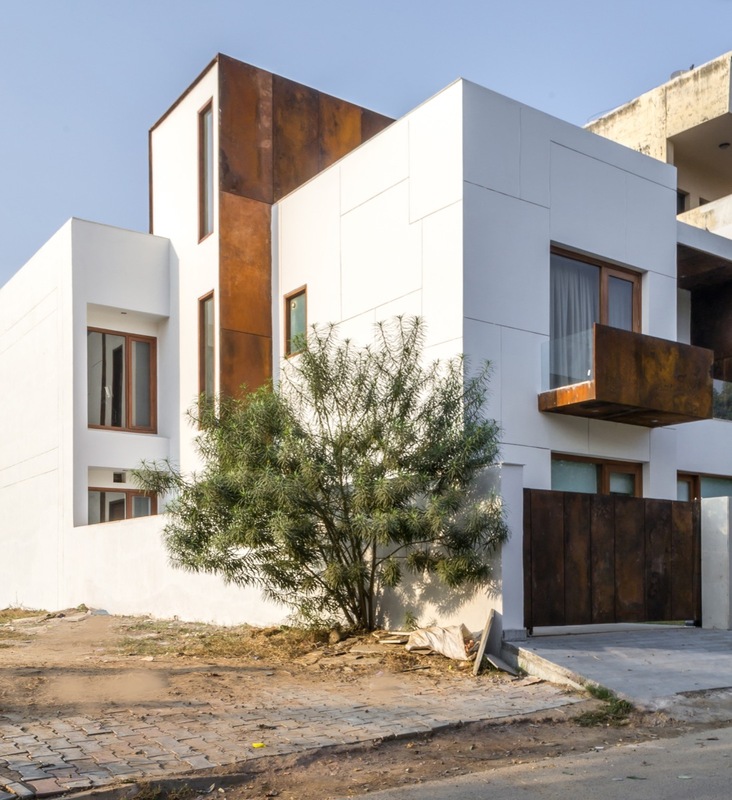 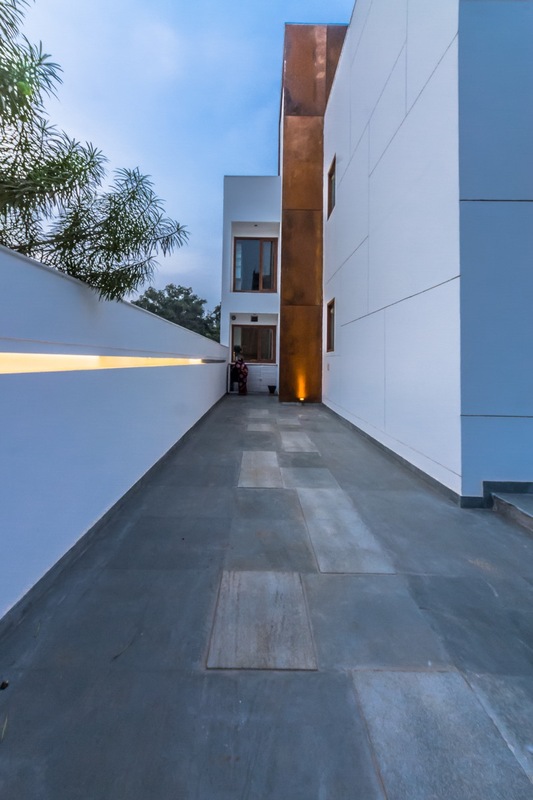 PRIMERA, Residence at Gurgaon, by R+D Studio - ArchitectureLive! 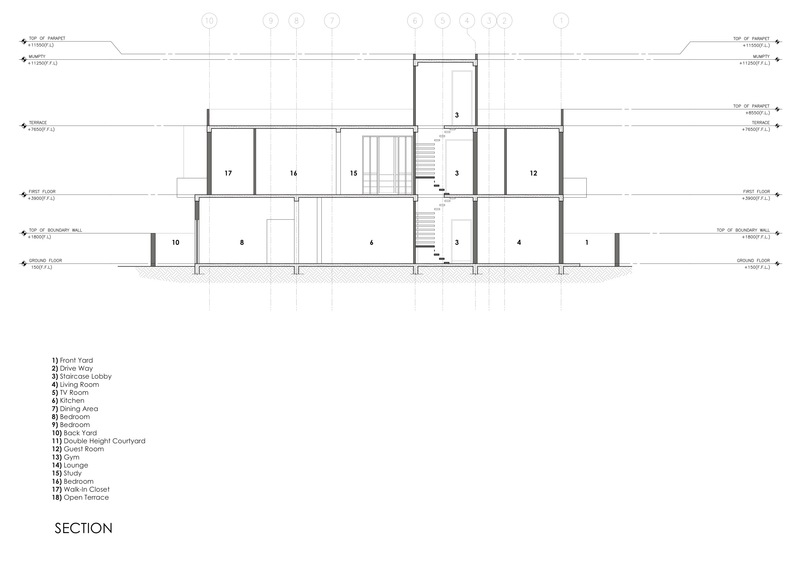 The architecture of the house explores a play of volumes, materials and stark play of light & shadow. 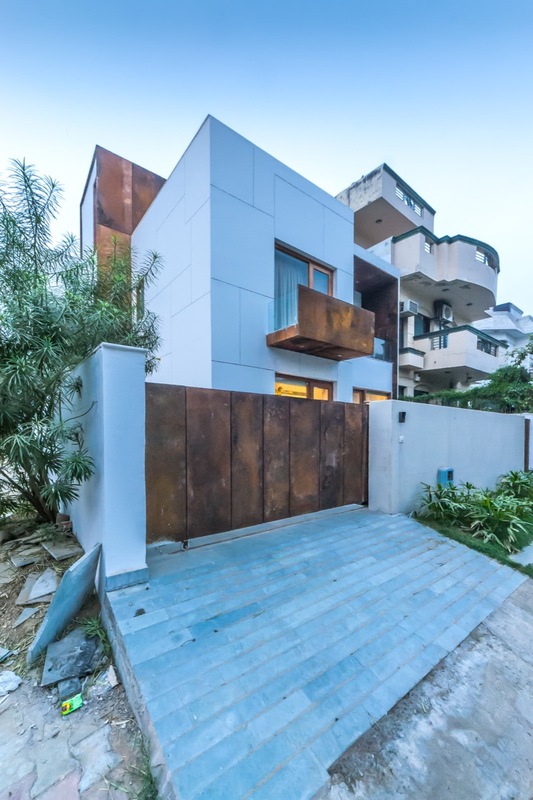 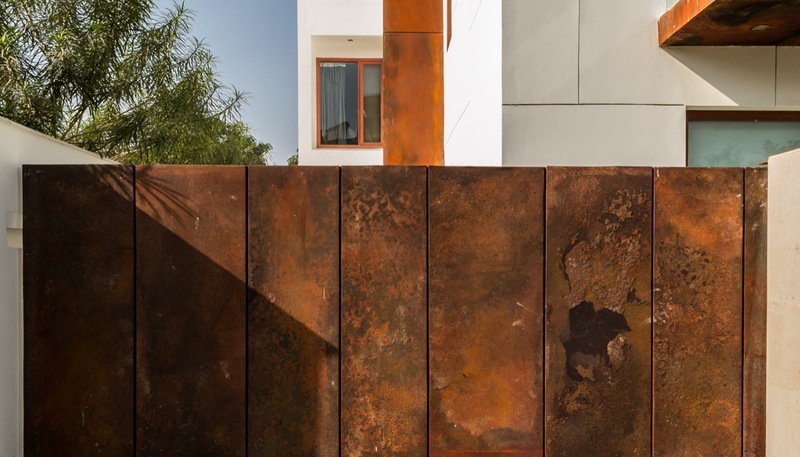 The volume blocking is strong & rigid with a further accentuation through contrasting materials – the stunning corten steel with stark whites. 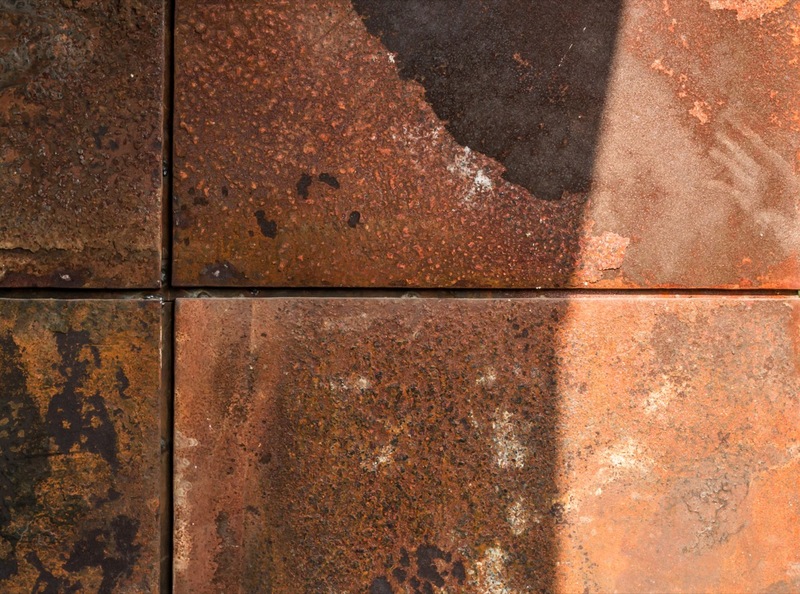 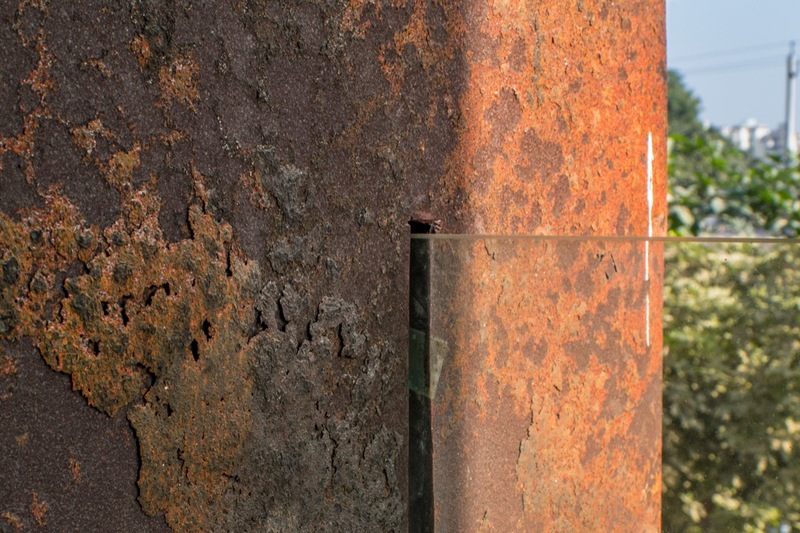 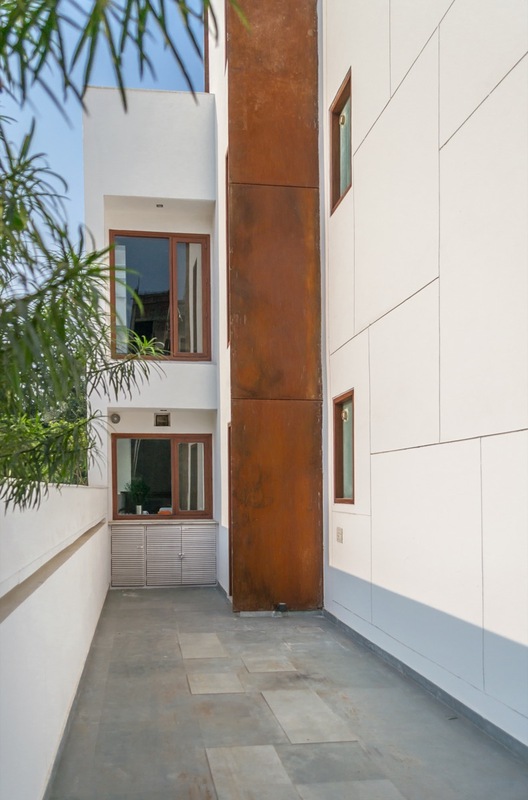 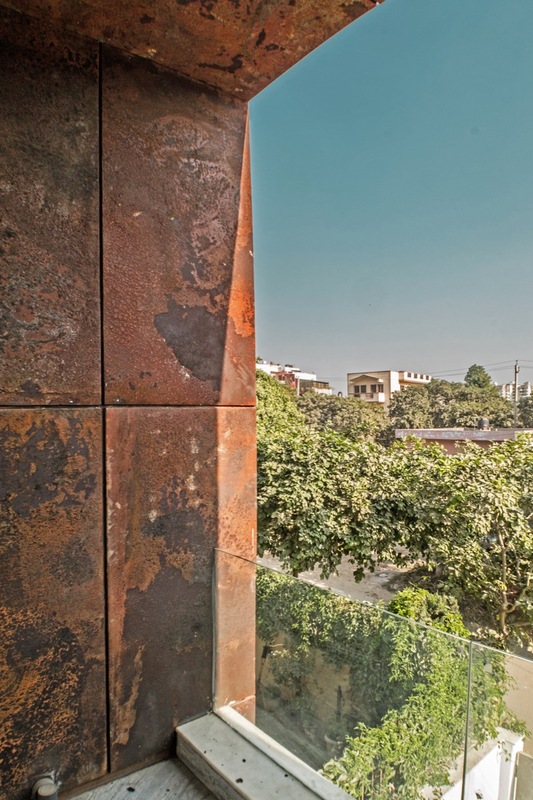 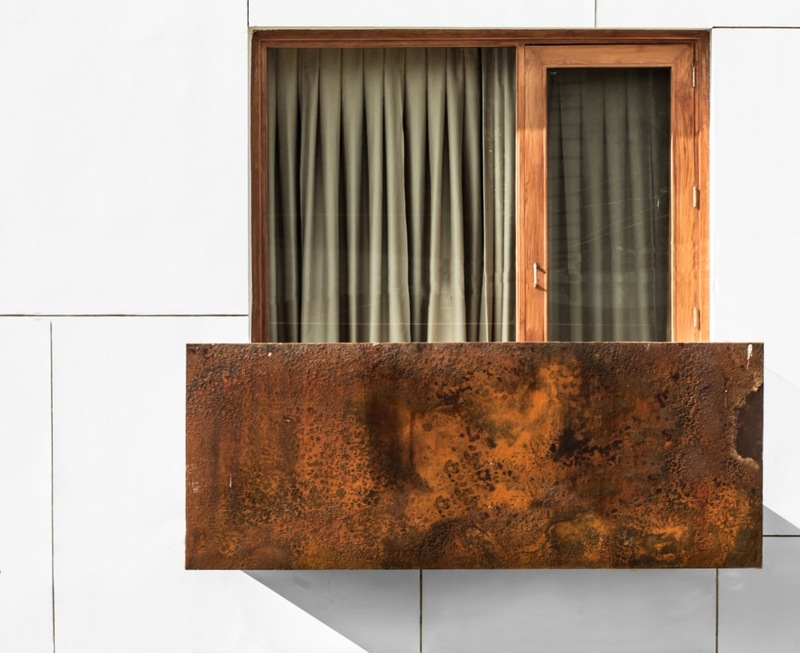 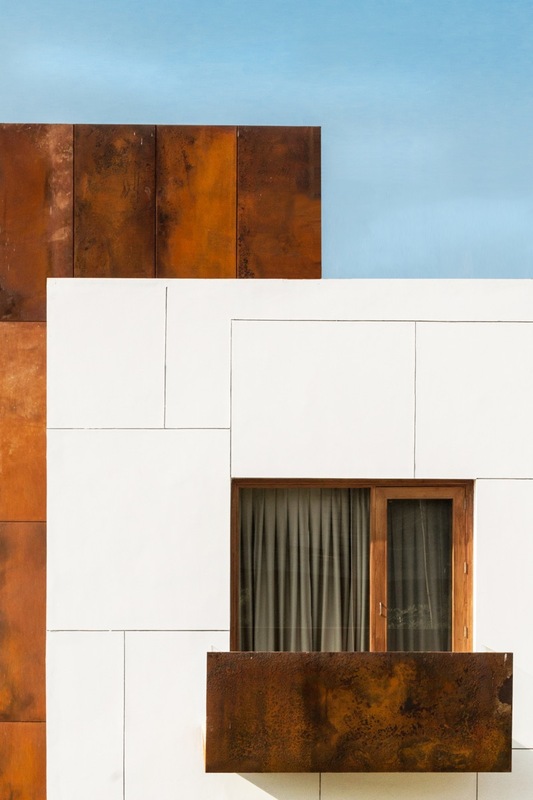 Corten steel is used prominently on the façade with seamless joining techniques following a strict geometry. 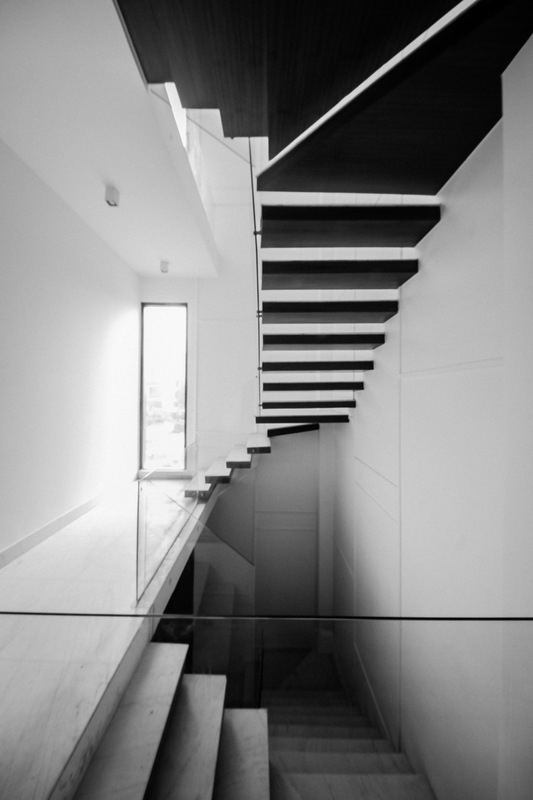 The monotony of white blocks is broken with sharp block patterns created through aluminum grooves. 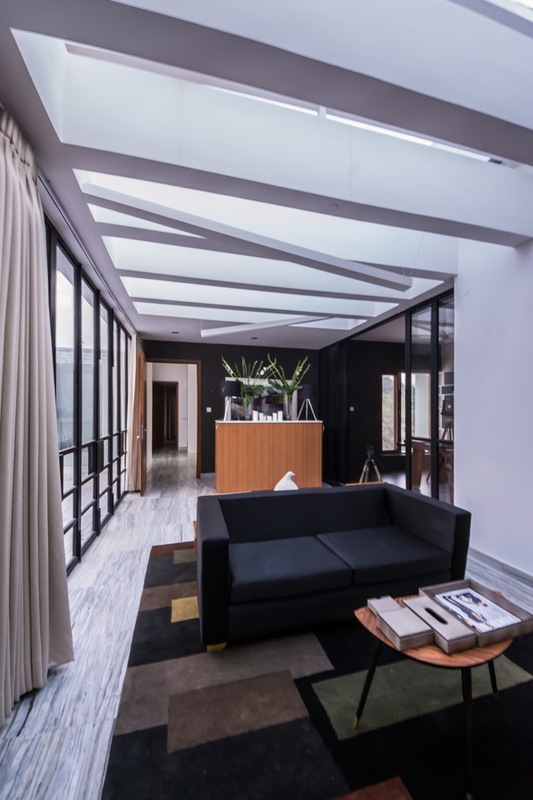 The house performs multi-functional role to suit the lifestyle of the clients – metamorphosing it’s spaces in a live-work-play system. 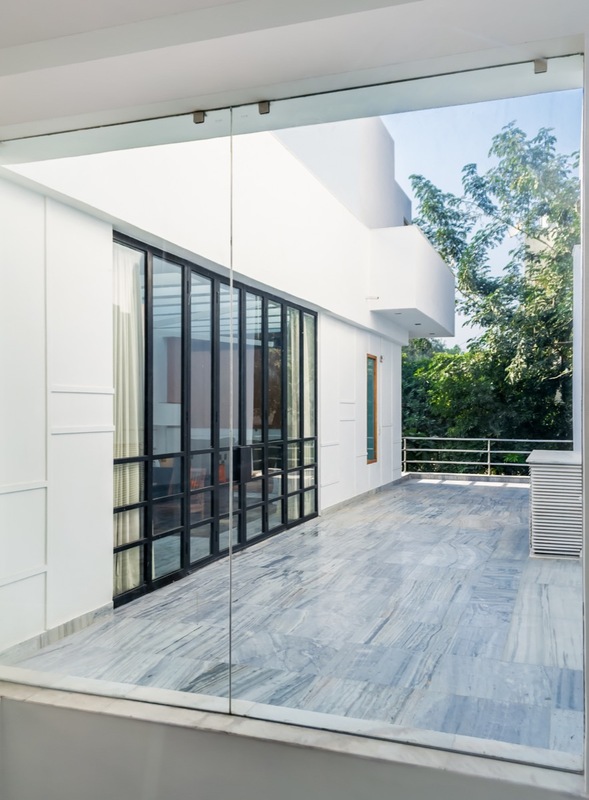 From a cozy family den, to a design studio to spaces to exhibit their love for art and a space for hosting soirees for large group of guests – the house was to serve a multitude of purposes leading to a smart segregation of functions for privacy as well as creating transformational spaces to suit a variety of situations. 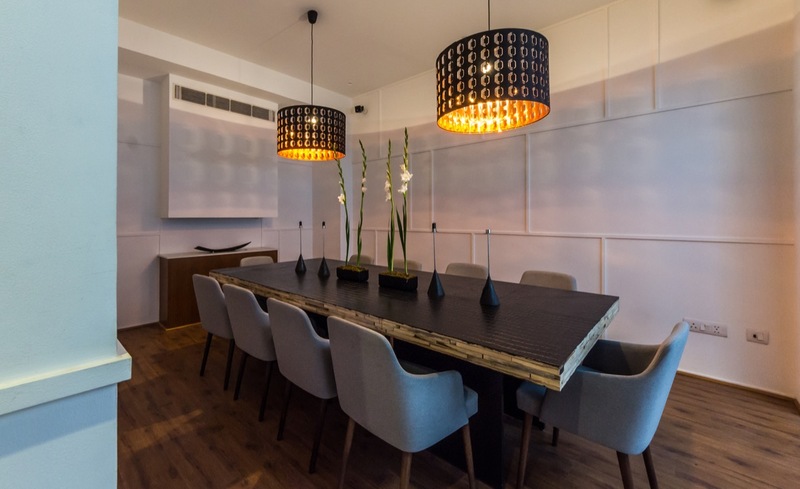 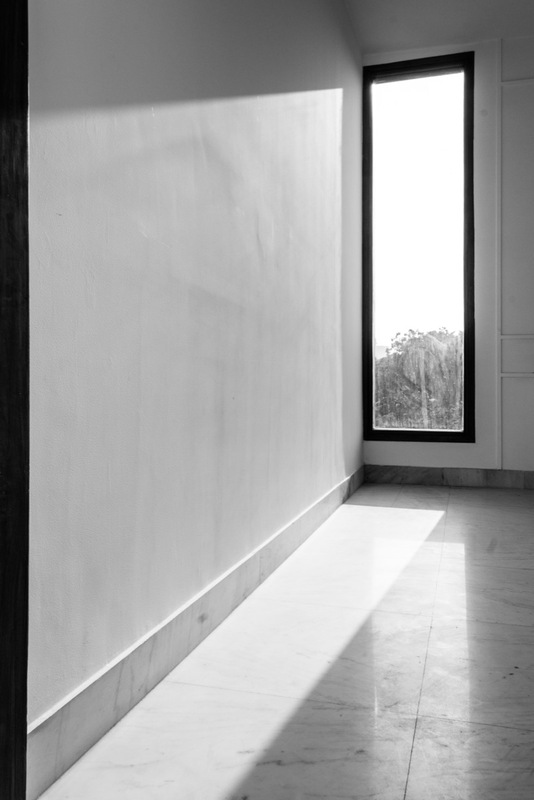 The interiors take a minimalist route with clean walls featuring art collections of the owners. 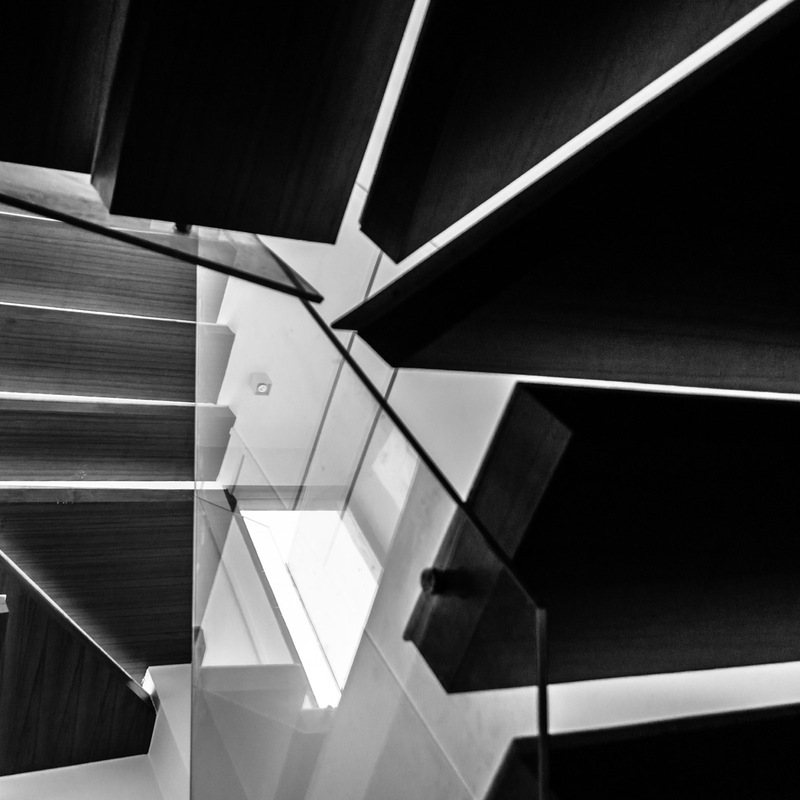 The challenge of the interiors lay in translating the fashion philosophy of the brand into a spatial story. 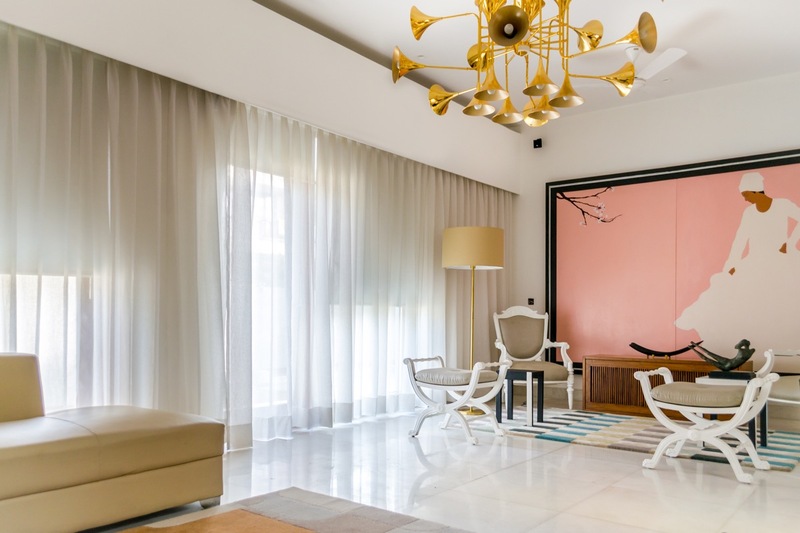 This involved taking the most recognizable facet of the brand, that is Color-blocking, and exploring interiors through that. 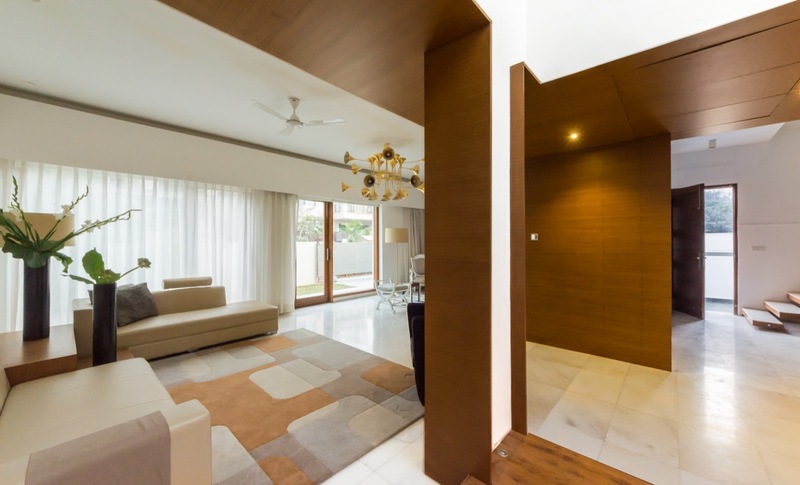 Hence, the usage of color blocked carpets, surfaces clad in teak to create stark contrasts with the white walls. 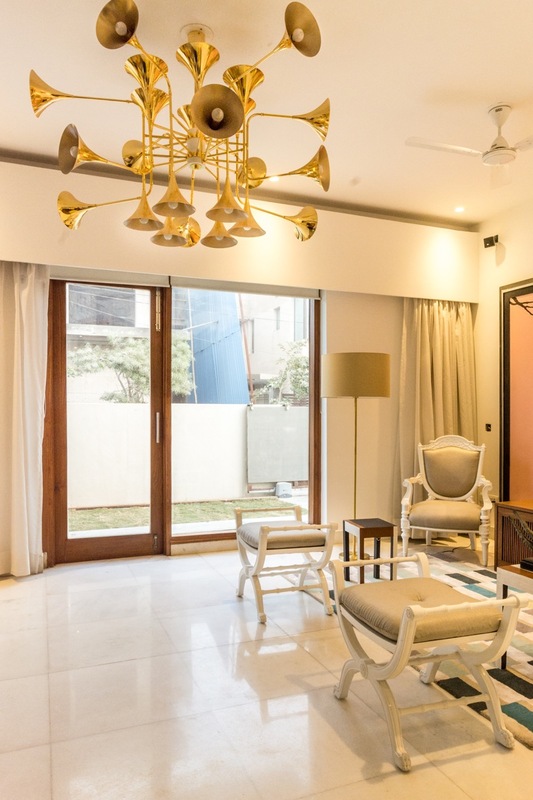 The main living room features an eclectic brass chandelier composed of saxophones, reminiscing the brand’s love for retro eras. 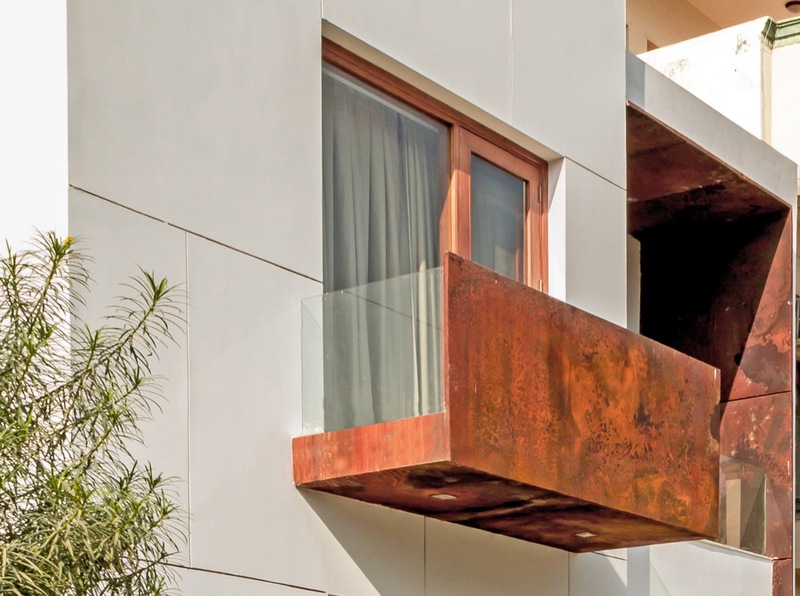 Brass highlights have been featured in furniture to infuse minimalist glamour. 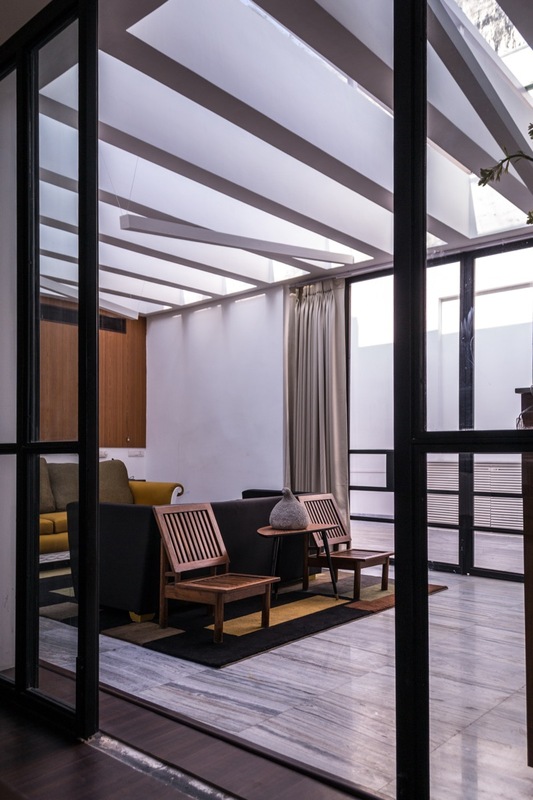 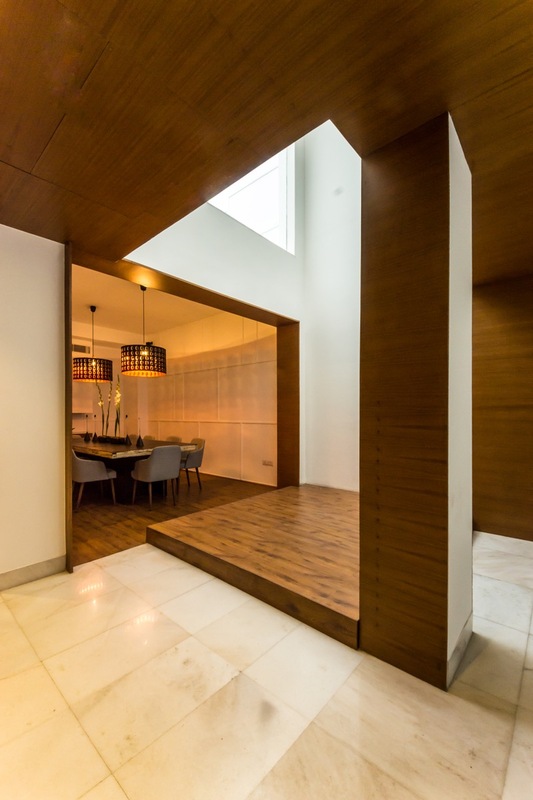 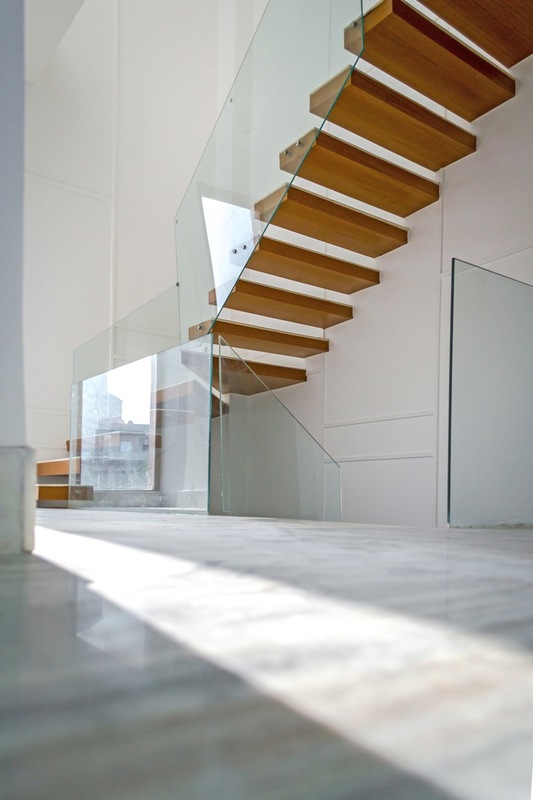 While the ground floor follows a more formal tone to spaces & interiors, the first floor houses a private suite in the form of linear spaces that join & split to move from public to private. 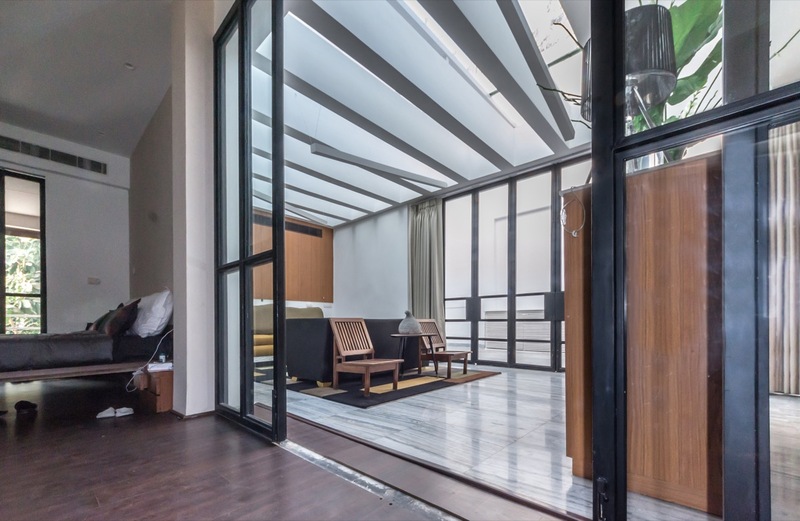 From an entry through the middle into the bar lounge, the space takes a loft-like approach through a pergola sun roof allowing natural light, sliding industrial doors and striped marble. 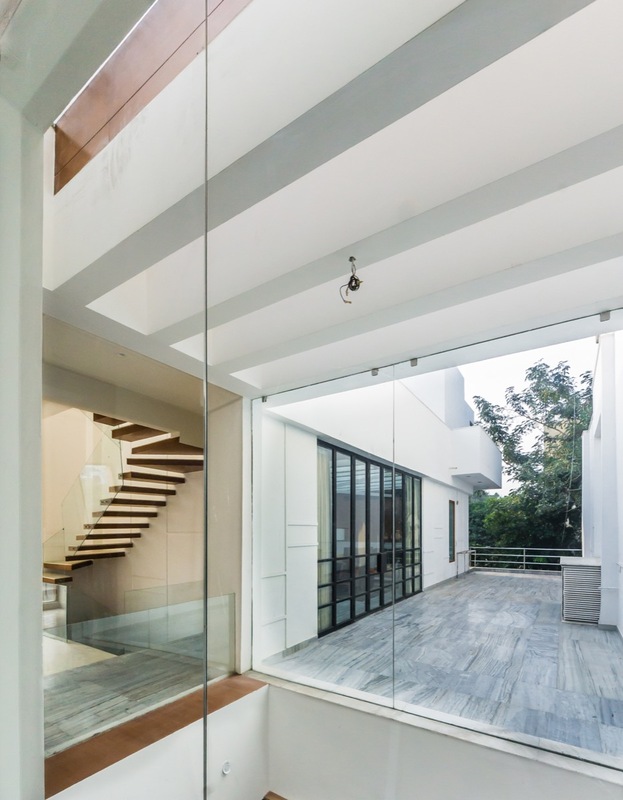 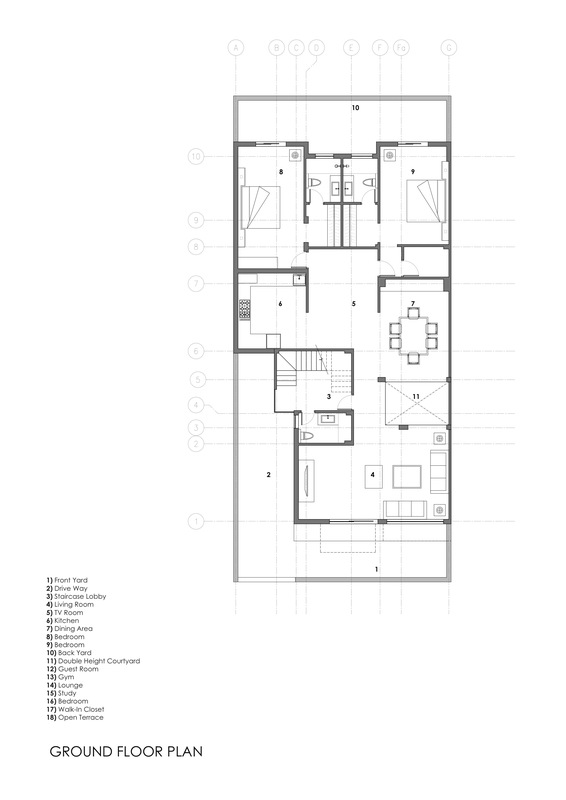 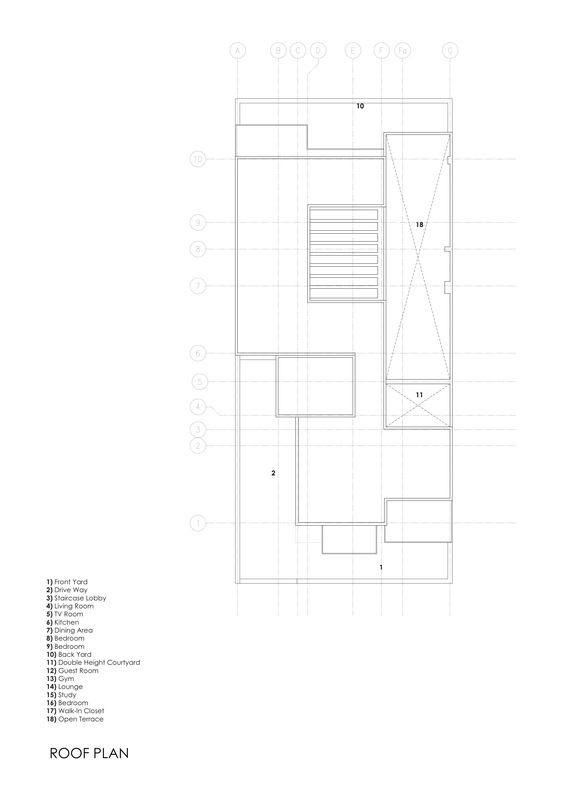 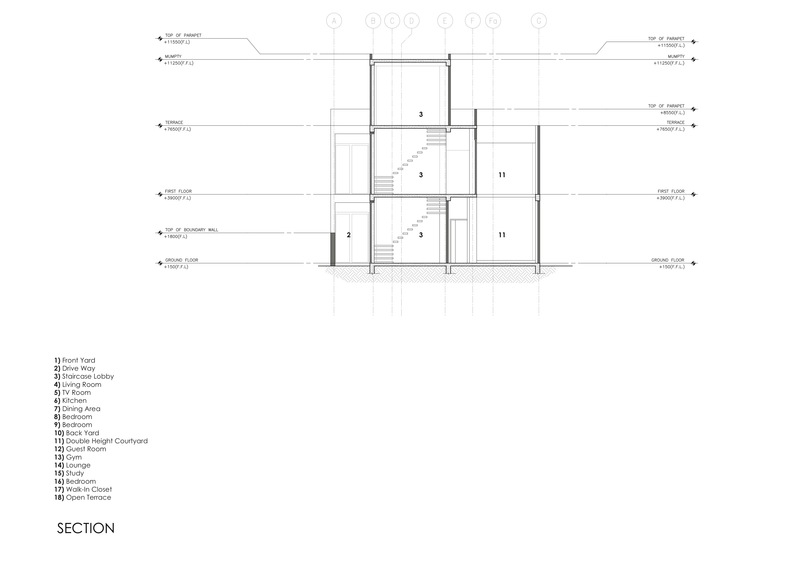 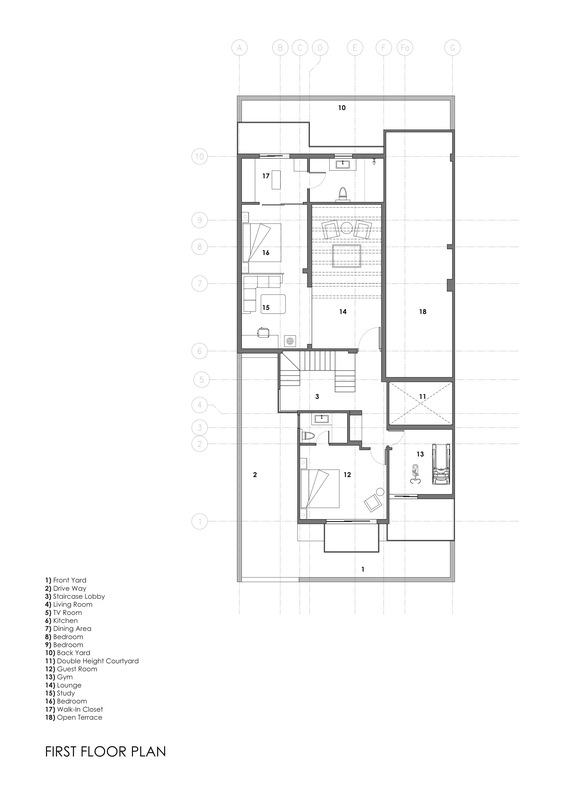 This section houses a bar lounge for entertainment which opens into a linear open air exhibition space, a design studio, and bedroom attached to a lyrically monochromatic bathroom.